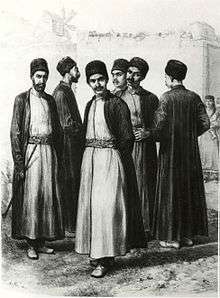 Karaite men in traditional garb, Crimea, 19th century. The Crimean Karaites or Krymkaraylar (Crimean Karaim: Кърымкъарайлар sg. къарай – qaray; Trakai Karaim: sg. karaj, pl. karajlar, Hebrew: קראי מזרח אירופה, Turkish: Karaylar), also known as Karaims and Qarays, are an ethnic group derived from Turkic-speaking adherents of Karaism in Central and Eastern Europe, especially in the territory of the former Russian Empire. "Karaim" is a Russian, Ukrainian, Lithuanian, and Polish name for the community. Khazars disappeared in the 11th century. But, the first written mention of the Crimean Karaites was in the 14th century. Some modern Karaim resist being identified as Jews, emphasizing their Turkic heritage and claiming they are Turkic practitioners of a "Mosaic religion" separate and distinct from Judaism. Miller says that Crimean Karaites did not start claiming a distinct identity apart from the Jewish people before the 19th century, and that such leaders as Avraham Firkovich and Sima Babovich encouraged this position to avoid the strong anti-Semitism of the period. From the time of the Golden Horde onward, Karaites were present in many towns and villages throughout Crimea and around the Black Sea. During the period of the Crimean Khanate, they had major communities in the towns of Çufut Qale, Sudak, Kefe, and Bakhchisaray. According to most opinions, the upper stratum of the Khazar society converted to Judaism in the 8th–9th centuries CE. The extent of this conversion and its scope is not known. With the collapse of the Khazar Khanate, a group of the Khazars who took part in a failed rebellion, joined the Magyars in the invasion of Hungary; they settled there at the end of the 9th century CE. An archeological relic of this Khazar settlement was discovered in Transylvania (today Romania) in the 20th century. Known as the Alsószentmihály Rovas inscription, it was transcribed by the archaeologist-historian Gábor Vékony. According to the transcription, the two-row inscription means the following: (first row) "His mansion is famous." (second row) "Jüedi Kür Karaite." or "Jüedi Kür the Karaite." According to Karaite tradition, Grand Duke Vytautas of the Grand Duchy of Lithuania relocated one branch of the Crimean Karaites to Lithuania. There they continued to speak their own language. But the Lithuanian dialect of the Karaim language differs significantly from the Crimean one. The Lithuanian Karaites settled primarily in Vilnius and Trakai, as well as in Biržai, Pasvalys, Naujamiestis and Upytė – smaller settlements throughout Lithuania proper. The Lithuanian Karaites also settled in lands of modern Belarus and Ukraine, which were part of the Grand Duchy of Lithuania. The Karaite communities emerged in Halicz and Kokizow (near Lwów) in Galicia, as well as in Łuck and Derazhne in Volhynia. Jews (Rabbinites and Karaites) in Lithuanian territory were granted a measure of autonomy under Michel Ezofovich Senior's management. The Trakai Karaim refused to comply, citing differences in faith. Later all Jews, including Karaites, were submitted to Rabbinite "Council of Four Lands" (Vaad) and "Council of the Land of Lithuania" taxation (1580–1646). 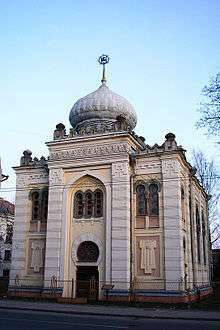 The Yiddish-speaking Rabbinites considered the Turkic-speaking Karaites to be apostates, and kept them in a subordinate and depressed position. The Karaites resented this treatment. In 1646 the Karaites gained expulsion of the Rabbinites from Trakai. Despite such tensions, in 1680 Rabbinite community leaders defended the Karaites of Shaty (near Trakai) against blood accusation. Representatives of both groups signed an agreement in 1714 to respect the mutual privileges and resolve disputes without involving the Gentile administration. According to Crimean Karaite tradition, which developed in the 20th century inter-war Poland their forefathers were mainly farmers and members of the community who served in the military forces of the Grand Duchy of Lithuania and the Polish–Lithuanian Commonwealth, as well as in the Crimean Khanate. According to the historical documents of the Grand Duchy of Lithuania, the chief occupation of the Crimean Karaites was usury. They were granted special privileges, including exemption from the military service. In the Crimean Khanate, the Karaites were repressed like other Jews, with prohibitions on behavior extended to riding horses. Some famous Karaim scholars in Lithuania included Isaac b. Abraham of Troki (1543–1598), Joseph ben Mordecai Malinovski, Zera ben Nathan of Trakai, Salomon ben Aharon of Trakai, Ezra ben Nissan (died in 1666) and Josiah ben Judah (died after 1658). Some of the Karaim became quite wealthy. During the times of the Polish-Lithuanian Commonwealth, the Karaim suffered severely during the Chmielnicki Uprising of 1648 and the wars between Russia and Commonwealth in the years 1654–1667. The many towns plundered and burnt included Derazhne and Trakai, where only 30 families were left in 1680. The destruction of the Karaite community in Derazhne in 1649 is described in a poem (both in Hebrew and Karaim language) by a leader of the congregation, Hazzan Joseph ben Yesh'uah Ha-Mashbir. Catholic missionaries worked to convert the local Karaim to Christianity, but were largely unsuccessful. 19th-century leaders of the Karaim, such as Sima Babovich and Avraham Firkovich, were driving forces behind a concerted effort to alter the status of the Karaite community in eyes of the Russian legal system. Firkovich in particular was adamant in his attempts to connect the Karaim with the Khazars, and has been accused of forging documents and inscriptions to back up his claims. Ultimately, the Tsarist government officially recognized the Karaim as being of Turkic, not Jewish, origin. Because the Karaim were judged to be innocent of the death of Jesus, they were exempt from many of the harsh restrictions placed on other Jews. They were, in essence, placed on equal legal footing with Crimean Tatars. The related Krymchak community, which was of similar ethnolinguistic background but which practiced rabbinical Judaism, continued to suffer under Tsarist anti-Jewish laws. Solomon Krym (b. 1864, d. 1936), a Crimean Karaite agronomist, was elected in 1906 to the First Duma (1906–1907) as a Kadet (National Democratic Party). On November 16, 1918 he became the Prime Minister of a short-lived Crimean Russian liberal, anti-separatist and anti-Soviet government also supported by the German army. Since the incorporation of Crimea into the Russian Empire the main center of the Qarays is the city of Eupatoria. Their status under Russian imperial rule bore beneficial fruits for the Karaites decades later. "Their Mosaic religion is unwelcome. However, on grounds of race, language and religious dogma... Discrimination against the Karaites is unacceptable, in consideration of their racial kinsmen [Berger was here referring to the Crimean Tatars]. However, so as not to infringe the unified anti-Jewish orientation of the nations led by Germany, it is suggested that this small group be given the opportunity of a separate existence (for example, as a closed construction or labor battalion)..."
Despite having exempt status, groups of Karaites were massacred in the early phases of the war. German soldiers who came across Karaites in Russia during the invasion of Operation Barbarossa, unaware of their legal status under German law, attacked them; 200 were killed at Babi Yar alone. German allies such as Vichy France began to require the Karaites to register as Jews, but eventually granted them non-Jewish status after getting orders by Berlin. When interrogated, Ashkenazi rabbis in Crimea told the Germans that Karaites were not Jews, in an effort to spare the Karaite community the fate of their Rabbanite neighbors. Many Karaites risked their lives to hide Jews, and in some cases claimed that Jews were members of their community. The Nazis impressed many Karaites into labor battalions. 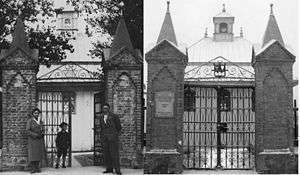 Karaim cemetery in Warsaw, established in 1890. 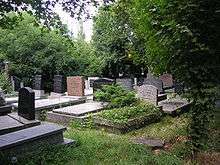 Karaim cemetery in Bakhchisaray Crimea. In Vilnius and Trakai, the Nazis forced Karaite Hakham Seraya Shapshal to produce a list of the members of the community. Though he did his best, not every Karaite was saved by Shapshal's list. After the Soviet recapture of Crimea from Nazi forces in 1944, the Soviet authorities counted 6,357 remaining Karaites. Karaites were not subject to mass deportation, unlike the Crimean Tatars, Greeks, Armenians and others the Soviet authorities alleged had collaborated during the Nazi German occupation. Some individual Karaites were deported. Assimilation and emigration greatly reduced the ranks of the Karaite community. A few thousand Karaites remain in Lithuania, Belarus, Ukraine, Russia and Poland. Other minor communities exist in Israel, Turkey, the United States, and Great Britain. The name "Crimean Karaites" has often been considered as something of a misnomer, as many branches of this community found their way to locations throughout Europe. As time went on, some of these communities spread throughout the region, including to Crimea. According to Karaite tradition, all the Eastern European Karaite communities were derived from those in the Crimea, but some modern historians doubt the Crimean origin of Lithuanian Karaites. Nevertheless, this name, "Crimean Karaites" is used for the Turkic-speaking Karaites community supposed to have originated in Crimea, distinguishing it from the historically Aramaic, Hebrew, and Arabic-speaking Karaites of the Levant, Anatolia, and the Middle East.For the purposes of this article, the terms "Crimean Karaites", "Karaim", and "Qarays" are used interchangeably, while "Karaites" alone refers to the general Karaite branch of Judaism. The local Karaim communities still exist in Lithuania (where they live mostly in Panevėžys and Trakai regions) and Poland. The 1979 census in the USSR showed 3,300 Karaim. Lithuanian Karaim Culture Community was founded in 1988. According to the Lithuanian Karaim website the Statistics Department of Lithuania carried out an ethno-statistic research entitled "Karaim in Lithuania" in 1997. It was decided to question all adult Karaim and mixed families, where one of the members is a Karaim. During the survey, for the beginning of 1997, there were 257 people of Karaim nationality, 32 of whom were children under 16. Until the 20th century, Karaism was the only religion of the Karaim, During the Russian Civil War a significant number of Karaim emigrated to Yugoslavia, Czechoslovakia, Poland and Hungary and then France and Germany. Most of them converted to Christianity. The Karaim's modern national movement philanthropist M.S. Sarach was one of them. The Crimean Karaites' emancipation in the Russian Empire caused cultural assimilation followed by secularization. This process continued in the USSR when most of the kenesas were closed. In the mid 1930s, he began to create a theory describing the Altai-Turkic origin of the Karaim and the pagan roots of Karaite religious teaching (worship of sacred oaks, polytheism, led by the god Tengri, the Sacrifice). Shapshal's doctrine is still a topic of critical research and public debate. 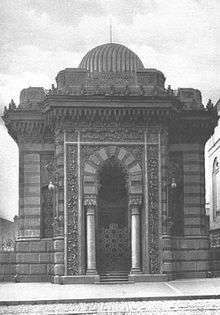 He made a number of other changes aimed at the Karaim's Turkification and at erasing the Karaite Jewish elements of their culture and language. He issued an order canceling the teaching of Hebrew in Karaite schools and replaced the name of the Jewish holidays and the months of the Turkic-speaking (see the table below). According to Shapshal, Crimean Karaites were pagans who adopted the law of Moses, but continued to adhere to their ancient Turkic beliefs. In addition, he claimed that the Karaites had revered Jesus and Mohammed as prophets for centuries. In the Post-Soviet period, Shapshal's theory was further developed in modern Karaylar publications(e.g. "Crimean Karaites legends") and was officially adopted by the Crimean Karaim Association "Krymkaraylar" (Ассоциация крымских караимов “Крымкарайлар”) as the only correct view of the Karaim's past and the present in 2000. Turkic name translated to English. Purim "Lots". Kynyš Three-cornered shaped sweet filled-pocket cookie. Leon Kull and Kevin Alan Brook led the first scientific study of Crimean Karaites using genetic testing of both Y chromosomal DNA and mitochondrial DNA and the results showed that Crimean Karaites are indeed partially of Middle Eastern origin and related to the descendants of rabbinic Jews. The most famous Crimean Karaite food is Kybyn (Russian:Кибина pl. Кибины, Karaim: kybyn pl. kybynlar, Lithuanian: Kibinai). 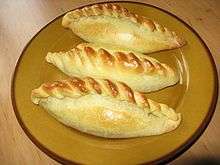 Kybynlar are half moon shaped pies of leavened dough with a stuffing of chopped beef or mutton, baked in dutch oven or baking sheet. Other meals common for Crimean Karaites and Tatars are Chiburekki, Pelmeni, Shishlik (These are most often made from mutton). Wedding pies are Kiyovliuk (on the part of the groom) and Kelin'lik (on the part of the bride). ↑ Ludność. Stan i struktura demograficzno-społeczna.Narodowy Spis Powszechny Ludności i Mieszkań 2011. ↑ "Gyventojai pagal tautybę, gimtąją kalbą ir tikybą" (PDF). Statistics Lithuania. Retrieved January 9, 2015. ↑ Brook 2006 p. 110–111, 231. ↑ A. Harkavy, Altjudische Denkmaler aus der Krim, mitgetheilt von Abraham Firkowitsch, SPb., 1876. 1 2 "Karaites of Crimea: History and Present-Day Situation in Community". Retrieved 14 April 2016. ↑ Nosonovsky, M.; Shabarovsky, V. (2005). "Караимская община XVI-XVIII веков в Деражном на Волыни". Vestnik EUM. 9: 31–52. ↑ Jacob Mann, "Karaica", Texts and Studies in Jewish History and Literature, no. 11, Philadelphia, 1935; Jurgita Šiaučiūnaitė – Verbickienė, Žydai Lietuvos Didžiosios Kunigaikštystės visuomenėje: sambūvio aspektai, Vilnius, 2009; Idem, Ką rado Trakuose Žiliberas de Lanua, arba kas yra Trakų žydai, in Lietuvos istorijos studijos, no. 7, 1999. ↑ Кизилов М. Ильяш Караимович и Тимофей Хмельницкий: кровная месть, которой не было, (М. Kizilov. Ilyash Karaimovich and Timofey Khmelnitsky: the blood feud that never took place) Institute of Oriental Studies of the Russian Academy of Sciences in publication Фальсификация исторических источников и конструирование этнократических мифов.«Hачиная приблизительно с межвоенного периода и вплоть до наших дней, караимские националисты стараются представить мирное караимское население Восточной Европы в роли «неустрашимых и храбрых воителей» , что едва ли одобрили их богобоязненные исторические предки, которые были преимущественно торговцами и ремесленниками». ↑ "Universitas Helsingiensis". Retrieved 14 April 2016. ↑ Древние привилегии литовско-волынских караимов, извлеченные из актов замка Луцкого 1791 г«Но вникнув в смысл привилегии Витольда замечаем, что в древние времена тамошние Караимы более всего занимались заимодавством; да, и по сие время зажиточные люди этого общества не оставляют этого прибыльного промысла; и отдавая свои капиталы в рост, в обеспечение их берут у своих должников в арендное содержание мельницы, корчмы, а чаще всего ссудят под заклад движимого имущества». ↑ Древние привилегии литовско-волынских караимов, извлеченные из актов замка Луцкого 1791 г«В следствие того они били челом его Королевской милости, что издавна еще при Великом Князе Витольде и при Сигизмунде и при отце нашем Короле Казимире его милости, жиды [Троцкие] (i.e Karaite Jews) никогда на войну не хаживали и не посылали». ↑ Nosonovsky, M. (2011). "The Karaite Community in Derażne and its Leader Hazzan Joseph ben Yeshu'ah". Eastern European Karaites in the Last Generations: 17–35. ↑ Harkavy, Albert. "Altjudische Denkmaller aus der Krim mitgetheilt von Abraham Firkowitsch, 1839–1872." In Memoires de l’Academie Imperiale de St.-Peterboug, VIIe Serie, 24, 1877; reprinted Wiesbaden, 1969. ↑ Fisher, Alan W. (1978). The Crimean Tatars. Hoover Press. p. 264. ISBN 978-0-8179-6662-1. Retrieved 2009-11-08. ↑ YIVO archives, Berlin Collection, Occ E, 3, Box 100, letter dated January 5, 1939. ↑ Катехизис, основы Караимского закона. Руководство по обучению Закону-Божию Караимского юношества. — СПб., 1890. ↑ Mikhail Kizilov. "Karaites and Karaism: Recent Developments". paper presented at the CESNUR 2003 Conference, Vilnius, Lithuania. Retrieved 14 April 2016. ↑ Seraphim, Peter Heinz. Das Judentum im Osteuropäischen Raum, 1938 "...126. Das Wappen der Karaimen am Eingang zu ihrer "Kenessa" in Troki bei Wilna..."
↑ Roman Freund «Karaites and Dejudaization» (Acta Universitas Stockholmiensis. 1991. – №30). ↑ М. Кизилов, «Новые материалы к биографии Шапшала»// Материалы девятой международной конференции по иудаике (2002), с. 255—273. ↑ «Попытки приписать крымским караимам чуждые этнос и религию, смешение этнических крымских караимов с караимами по религии, искажение истории — оскорбляют национальные чувства и создают предпосылки для национальных и религиозных конфликтов.» («Attempts to attribute the Crimean Karaites alien ethnicity and religion, mixing ethnic Crimean Karaites with the Karaites on religion, the distortion of history – offend the national feelings and create the conditions for national and religious conflicts») Караи (крымские караимы). История, культура, святыни. — Симферополь, 2000. ↑ "Караимские праздники.". Retrieved 14 April 2016. 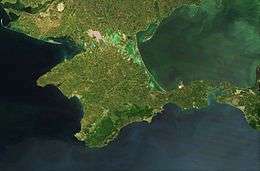 ↑ "Народы России - Национальная кухня крымских караимов (караев)". Retrieved 14 April 2016. 1 2 "Календарь". Retrieved 14 April 2016. Ben-Tzvi, Yitzhak. The Exiled and the Redeemed. Philadelphia: Jewish Publication Society, 1957. Blady, Ken. Jewish Communities in Exotic Places. Northvale, N.J.: Jason Aronson Inc., 2000. pp. 115–130. Brook, Kevin Alan. The Jews of Khazaria. 2nd ed. Rowman & Littlefield Publishers, Inc, 2006. Friedman, Philip. "The Karaites under Nazi Rule". On the Tracks of Tyranny. London, 1960. Golden, Peter B. (2007a). "Khazar Studies: Achievements and Perspectives". In Golden, Peter B.; Ben-Shammai,, Haggai; Róna-Tas, András. The World of the Khazars: New Perspectives. Handbook of Oriental Studies. 17. BRILL. pp. 7–57. ISBN 978-9-004-16042-2. Retrieved February 13, 2013. Karaite Judaism: Introduction to Karaite Studies. Edited by M. Polliack. Leiden: Brill Publishers, 2004, 657–708. Kizilov, Mikhail. Karaites Through the Travelers' Eyes: Ethnic History, Traditional Culture and Everyday Life of the Crimean Karaites According to the Descriptions of the Travelers. Qirqisani Center, 2003. Kizilov, Mikhail. "Faithful Unto Death: Language, Tradition, and the Disappearance of the East European Karaite Communities," East European Jewish Affairs 36:1 (2006): 73–93. Miller, Philip. Karaite Separatism in 19th Century Russia. HUC Press, 1993. Semi, Emanuela T. "The Image of the Karaites in Nazi and Vichy France Documents," Jewish Journal of Sociology 33:2 (December 1990). pp. 81–94. Shapira, Dan. "Remarks on Avraham Firkowicz and the Hebrew Mejelis 'Document'." Acta Orientalia Academiae Scientiarum Hungaricae 59:2 (2006): 131–180. Shapira, Dan. "A Jewish Pan-Turkist: Seraya Szapszał (Şapşaloğlu) and His Work 'Qırım Qaray Türkleri'," Acta Orientalia Academiae Scientiarum Hungaricae 58:4 (2005): 349–380. Shapira, Dan. Avraham Firkowicz in Istanbul (1830–1832). Paving the Way for Turkic Nationalism. Ankara: KaraM, 2003. Zajączkowski, Ananiasz. Karaims in Poland: History, Language, Folklore, Science. Panistwowe Wydawn, 1961. National or ethnic groups in Ukraine of over 1,000 people are shown.